When it comes to electrical problems with your motorcycle Bikes Built Better has the experience to quickly diagnose and repair stubborn electrical problems. When it’s time to replace electrical on your motorcycle we trust Ricks Motorsports Electrics for quality and value. Rick's Motorsport Electrics manufacturers OEM-style aftermarket electric replacement parts for motorsport vehicles. Cost effective alternatives to OE (Original Equipment) parts. Rick's manufacturers and supplies Rectifier Regulators, Stators & Stator Parts, Rotors, Alternators, Starter Motors, Solenoid Switches, Ignition Coil, Pulse Generating Source Coils, Trigger (Pick-up) Coils and more. Ricks Electric only uses the highest quality components and their 25+ years of experience to manufacturer aftermarket parts, resulting in the same if not better quality parts than the originals. All regulator/rectifiers are new and built to OEM specifications. Includes 1 year manufacturer warranty. High quality cost effective replacement for OEM. Most units are direct replacement pieces and come with the factory plug ends. Some models have a "Hot Shot" as the size, these are high performance, heavy duty Hot Shot versions made with special Mosfet technology that does not get hot. We also know there is a need for universal rectifier regulators for certain unique machines. In this case, the rectifier regulator will come with wire leads only and you will need to hard wire it. 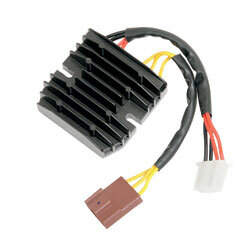 Rick's Motorsport Electrics has been providing stators for over 30 years. Rick's manufacturers new and rebuilds custom stators for motorcycles, ATVs, UTVs, off road, street bikes, & snowmobiles. 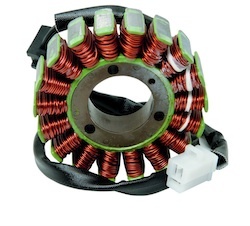 All rebuilt stators require a core exchange and come with a one year replacement warranty. Most new and rebuilt stators are built to stock specification, but we do offer some high output stator versions as part of the Hot Shot Series so you can get even more electrical power from your machine. We back our stators with a one year warranty. Stators come with a wire harness, rubber grommets, and all end connectors for a more tech friendly installation whenever possible. Rick's Motorsport Electrics has been providing aftermarket starter motors for over 30 years. Rick's manufacturers new and rebuilds custom starter motors for motorcycles, ATVs, UTVs, off road, street bikes, & snowmobiles. All rebuilt starters require a core exchange and come with a one year replacement warranty. On all of our starter motor rebuilds, the entire armature is redone as well as any brushes/brush plates. Most rebuilt starter motors have a core charge that will be refunded once you send your old piece back to us. 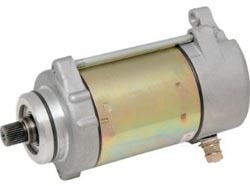 We back our starter motors with a one year warranty. Starters bolt on as direct replacements for OEM. Constructed with longer-life bearings. Rick's manufacturers and supplies OEM-Style Electric Motorsport Parts Rectifier Regulators, Stators & Stator Parts,Rotors, Alternators, Starter Motors, Solenoid Switches, Ignition Coil, Pulse Generating Source Coils, Trigger (Pick-up) Coils and more.